Envantage is now distributing the award winning VUV Analytics Vacuum Ultraviolet Detector (VUV). The VUV detector provides reliable quantitative identifications of components. A large spectral library and sophisticated de-convolution software combine to create a powerful universal detection system that will potentially eliminate problems caused by co-elution and shifting retention times. Analyses that require complex column combinations, valving, tuning, and multiple detectors can be simplified and run faster with a single column. Standardized methods are beginning to appear; ASTM D8071 is a PIONA+ method for finished gasoline and is currently available from Envantage. In 34 minutes this method provides information that historically required the use of several ASTM methods, or more comprehensive methods. 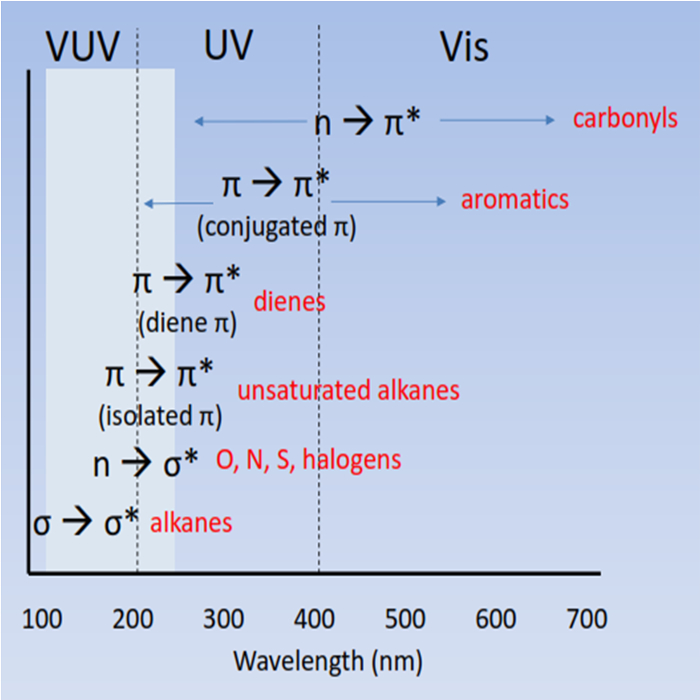 The VUV detector operates in the short wavelength region (120-240 nm) of the ultraviolet spectrum, an area of high energy absorbance that provides unique spectral fingerprints of nearly every compound. The detector is connected to a GC through a heated transfer line. Analytes arrive in the flow cell and are exposed to VUV light from a deuterium lamp. The VUV detector is non-destructive and can exhaust analytes or hyphenate with other GC detectors if desired. 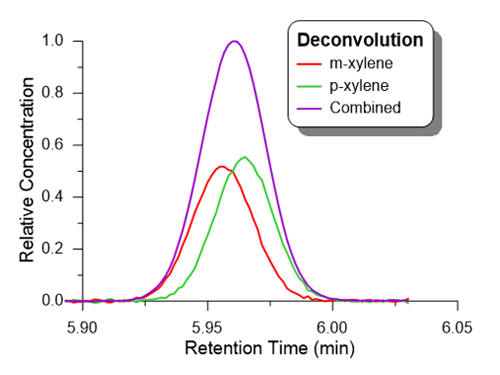 Baseline separation of analytes is not necessary due to the resolving power of spectral de-convolution. 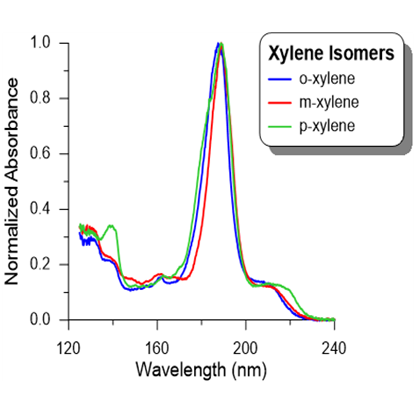 In this example xylene isomers can be easily distinguished in the fitting routine; minor differences are significant. When components co-elute the VUV software de-convolves spectral peak areas. VUV Time Interval De-convolution (TID) methodology uses Beer’s law to measure areas of analytes. 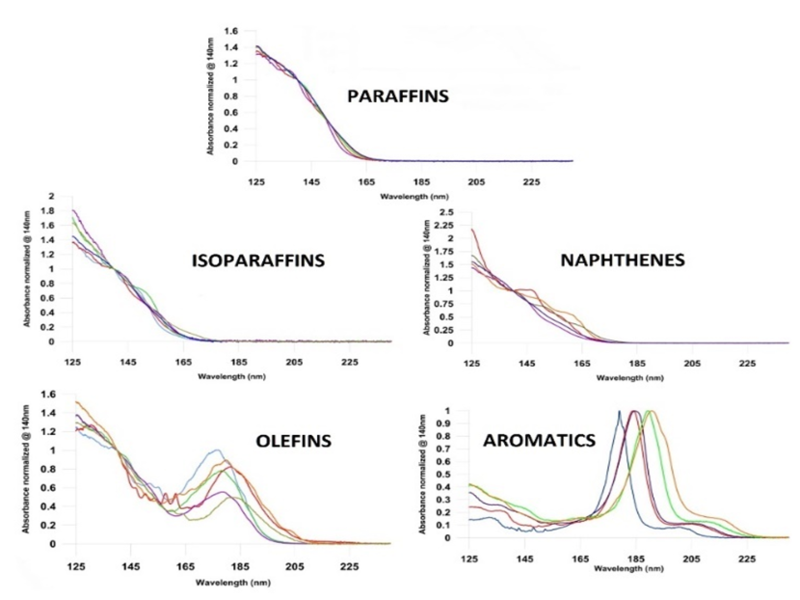 Each compound class displays distinct spectral features. This allows measurement of group-type concentrations and aids in speciation of individual components. 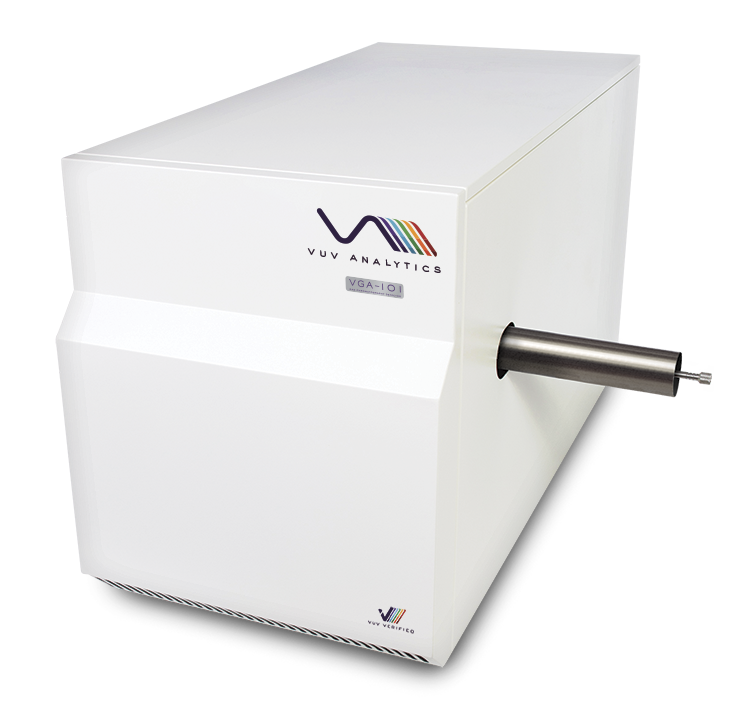 The class-based features inherent in VUV absorbance spectra enabled rapid development of the TID VUV-PIONA+ solution (D8071). Class information is discernible without necessarily having to incorporate a reference spectrum for every one of the potentially hundreds of compounds that might occur in gasoline. Class information can be gleaned by considering the closest match to spectra that are available in the library. VUV Analytics continues to develop applications for the VUV detector. As the VUV detector moves from research tool to production it is projected to become an important process tool that can provide reliable complex data in a short amount of time. The fact that it is a flameless detector is an added safety bonus in a production environment. Envantage is currently collaborating with VUV on a DHA-VUV application called VHA (Verified Hydrocarbon Analysis). VHA shows great potential to be a faster analysis that generates DHA data more reliably with less interaction required of the chemist.